High velocity marine currents are found in tidal areas and between land masses like Cuba and Florida and between Cuba and the Yucatan Peninsula. Up to 3 knot currents have been recorded in the Florida Straits. The highest current velocities are usually recorded near the water's surface. There are many concepts that have been patented and some developed to turn marine currents into power, but most of these concepts have underwater mechanical components that are very difficult and expensive to maintain. The "Current Catcher Pontoon Barge" only has structural components below water and no mechanical components underwater. The paddles are underwater structural components that are not subject to wear and are designed to be very large and have very high drag coefficients so they can catch as much force as possible from the high velocity surface currents. The paddle wheels have easily replaceable bearings located above water. Keeping all mechanical equipment above water under a water tight dry enclosure allowing quick and safe maintenance and replacement of wear components and equipment preservation which is a major advantage of the "Current Catcher Pontoon Barges" resulting in maximum uptime and low OPEX. Other significant advantages of "Current Catcher Pontoon Barges" are that: 1) their pontoons are the lowest cost form of floating offshore structure; 2) they can be built almost anywhere in the world; 3) they can be towed to site and attached to their pre-installed mooring lines and export power cable in less than a day; 4) they are ready to start producing power immediately; 5) their 20m OD paddle wheels supply enough torque to power four 6 megawatt direct drive wind turbine type generators (located under the barge enclosure) at their maximum capacity. "Current Catcher Pontoon Barges" can also support subsurface current generators (like Marine Energy Corporation's Current Catcher Frames) for additional power generation capacity and provide surface maintenance facilities for the subsurface generators without the need to mobilize special underwater maintenance vessels. Click for the Current Catcher Pontoon Barge© Presentation. The US, Mexico and Cuba could jointly work together to develop the best technology for these shared high velocity current areas. "Current Catcher Pontoon Barges" should produce very low LCOE costs in high velocity marine current areas and possibly lower than new onshore wind power plants and new gas power plants. Provide the Lowest Cost per Megawatt of any other Marine Current Power Generating Device. Convert significant amounts of marine current into power making the power farm projects worth the effort and time of the developers, designers, fabricators, installers and operators. Use the lowest cost existing components like four existing 6 megawatt direct drive wind turbine type generators, steel box cross section pontoons. Use the lowest cost floating support structure, a pontoon barge. 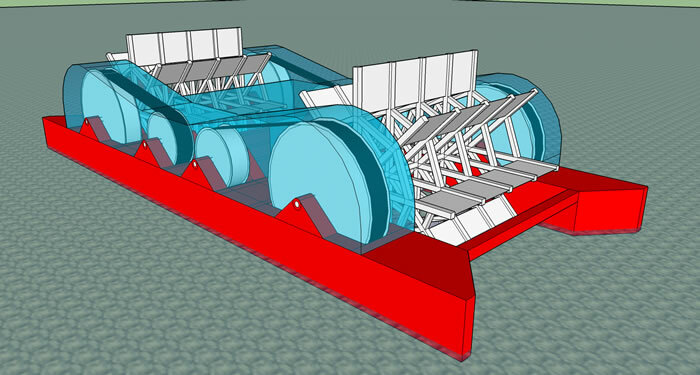 Shape the barge's pontoons so they increase the current velocity across the paddles. Locate all mechanical and electrical equipment above water in a dry enclosure for safe and fast maintenance and for long term preservation. Fly or boat maintenance crews in order to quickly access all mechanical and electrical equipment for maximum uptime. Make the pontoon barges able to survive 100 year storms. Make the pontoon barges so they minimize mooring systems and associated costs. Uses only simple, proven, reliable and low components. Uses large low cost, large area and high drag coefficient paddles. Install the barge quickly, easily and for the lowest installation costs. Make the barge quickly and easily removed for dry docking every 15 years at the lowest possible removal costs. Dry docking is required for repainting every 15 years because that is the maximum life expectancy so far for marine paint. The hull can undergo underwater on site inspection every 5 years without barge removal. Power generation can start immediately after installation. Copyright © 2012-2018 Marine Energy Corporation. All Rights Reserved.